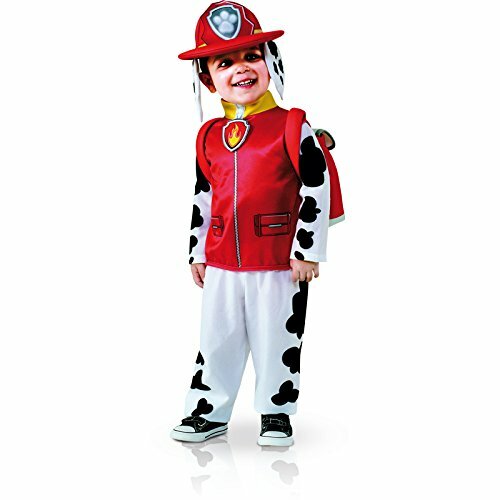 Rubie's Costume Toddler PAW Patrol Marshall Child Costume, One Color, 3-4 Years | What Should I Say? Your little will be all fired up and ready for a ruff-ruff rescue in this adorable officially licensed Marshall costume! Every pup on PAW Patrol brings unique personality and skill to the team, modeling the importance of teamwork and good citizenship. Rubies' Costume Company has the licensed and non-licensed costumes, decor and accessories for every season: Halloween, Christmas, Mardi Gras, Easter and all in-between. Family-owned and operated in New York State since 1950, Rubies' has a serious mission to make dress-up fun and safe. You'll find traditional costumes for kids and adults, flirty looks for women, mascot and rental quality costumes, haunted house decor, masks, wigs, accessories, shoes and more - you'll find it all under the Rubies' brand! Ready for a ruff-ruff rescue!